He was on his way home from work when someone threw acid on his face. He had to swallow acid to keep breathing, even though it damaged his lungs. Not only was he seriously disfigured he also lost an eye in the attack. Transparency International Sri Lanka (TISL) conferred the National Integrity Award on him in 2004 for his fearless service as an Audit Superintendent in the Auditor General’s Department. He was none other than Lalith Ambanwela, an exemplary public servant. 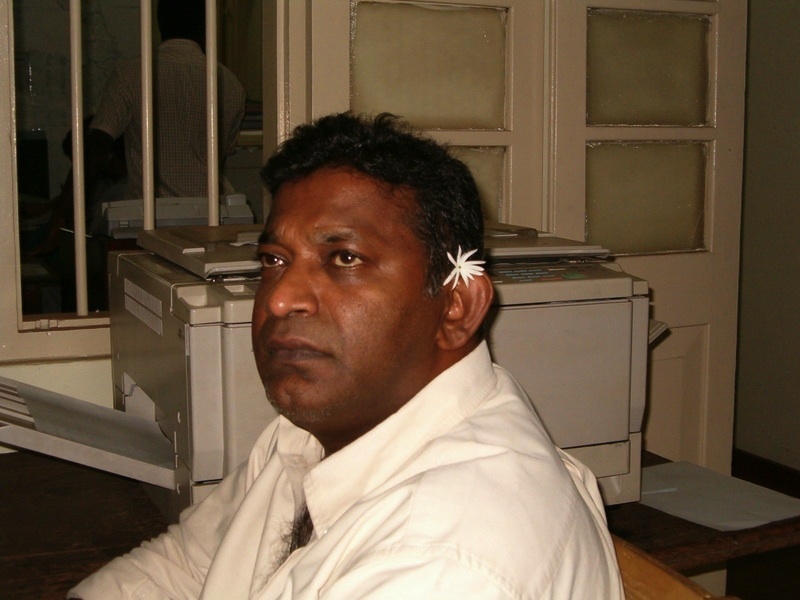 Dr Paikiasothy Saravanamuttu, the Executive Director of the Centre for Policy Alternatives (CPA) was a TISL director at the time it was decided that Ambanwela deserved the Award. Shelton Wanasinghe, a CPA director, was the judge who selected Amabanwela from the nominees. Ambanwela was subjected to this acid attack while investigating corruption at the Education Department, Central Province. In addition to fraud committed in tender procedures, the inquiry also focused on embezzlement of funds amount to Rs 8 million for a series of workshops that were never held. Lalith Ambanwela stated that vouchers had been submitted to obtain money for these un-held workshops. Ironically today Dr Saravanamuttu is himself accused of similar kinds of corruption – billing for un-held workshops, double billing scandals; i.e getting grants from two donors to do the same task and duplicating receipts, hotel bills and other bills to submit to donors (perhaps even submitting same bills to multiple donors), and hoodwinking donors by filing expenses under safe cost columns. 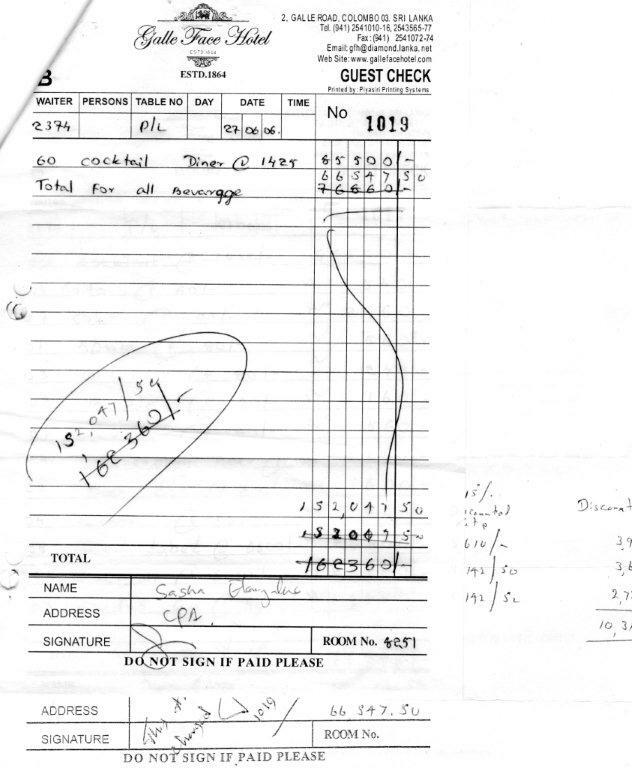 On one particular occasion the CPA asked Galle Face Hotel to issue four bills for the same amount — invoices on the same day but under different descriptions. We’ll come to this matter later. a. Have you taken any action regarding the information provided by Colombo Telegraph? b. Has CPA launched an investigation into this particular bill for alcohol? 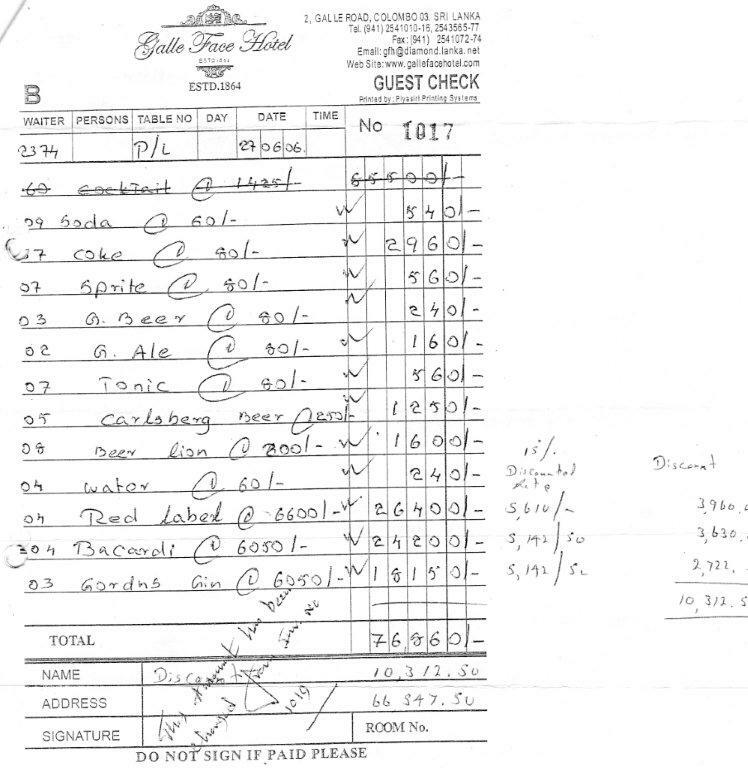 c. Were these original bills (detailing purchase of alcohol) submitted to the accounts unit by the relevant unit coordinator (as Sanjana claims is standard practice)? d. Were these details mentioned in the ‘Narrative Report’ which according to Sanjana must have been submitted by the CPA’s accounts unit to the relevant donor as per accepted CPA procedures (as mentioned by Sanjana)? If it was, as claimed, a genuine transaction, why obtain 4 bills from Galle Face for the same thing? The CPA is yet to give a satisfactory explanation for this strange accounting behavior. Interestingly, there was no such cocktail reception in the project proposal CPA submitted to the European Union. Besides, the EU has repeatedly advised their beneficiaries in every workshop that they do not accept alcohol bills. 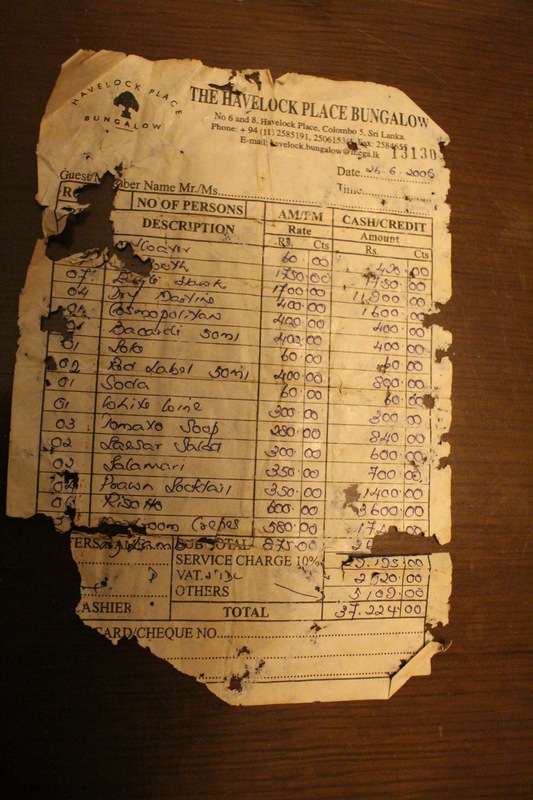 (Click here for the original bill which says for 60 people part one – part two , click here for the second bill and third bill and click here for the fourth bill which says “BQT – National Meeting Dinner for 100 people”). We have another bill. 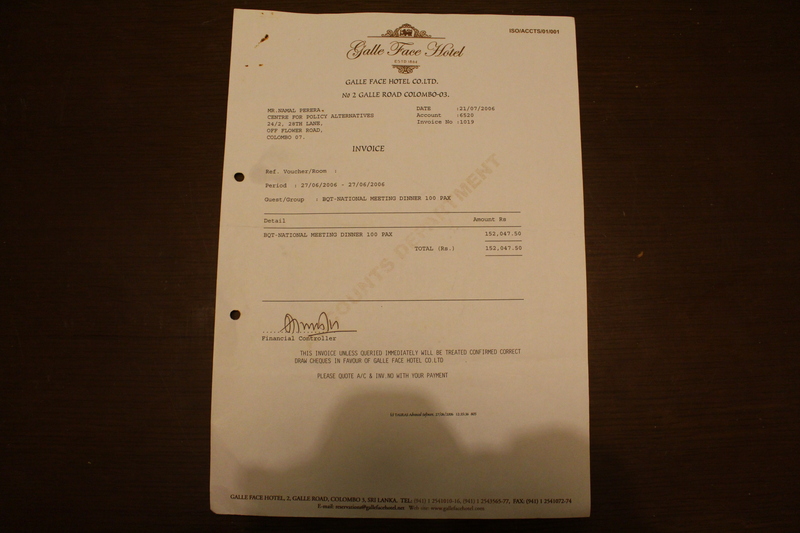 It is for the purchase of liquor at the Havelock Bungalow to the tune of Rs 37,000. This bill also inserted in a safe column. The irony is that even while people were boozing up and getting gullible and negligent donors to pay for it, the CPA continues to ask the public for donations to fund their activities. Even the Colombo Telegraph received an email asking for donations! What was this Public Service Broadcasting Project? The CPA together with the International Federation of Journalists (IFJ) (one of the most corrupted media organisations in world IFJ, famous for all kinds of deceit and fraud including double-billing at least in the Asian region, as exposed by Colombo Telegraph and the Sunday Leader a long time ago) submitted proposals to the European Union and UNESCO to promote public service broadcasting. The CPA and IFJ were given the money by both donors to accomplish the same task. 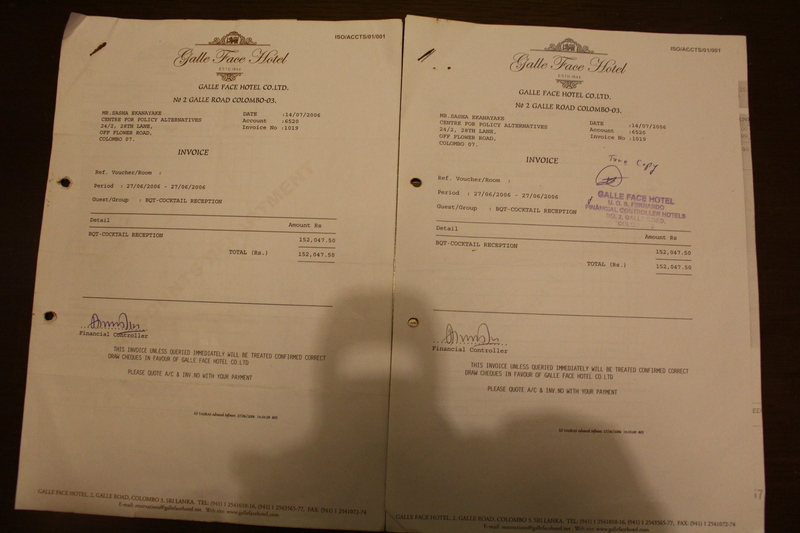 What CPA did was submit the same bills/invoices to both donors, without even completing the given/proposed tasks! The European Union awarded the CPA a grant amount to Euro 99497.16 to implement this project, titled “Toward Public Service Media in Sri Lanka: Sharing the EU Sri Lanka experience”. (( Click here for CPA/ IFJ EU financial reports) UNESCO also gave approximately the same amount or less for the same project. The financial accounts relevant to the project published by the CPA are “lacking in clarity”. The final accounts published are sketchy. They refer to “notes” which are not made available to whoever who wants to examine the accounts. (Click here to see CPA accounts). Colombo Telegraph has specifically requested the CPA to furnish details on the project funds, but CPA has not done so and hasn’t even responded to the request. There’s more on this later. Without giving a clear answer Dr Saravanamuttu repeatedly asked us to provide documents. Perhaps he may have thought that Colombo Telegraph has no documents to prove the allegations. 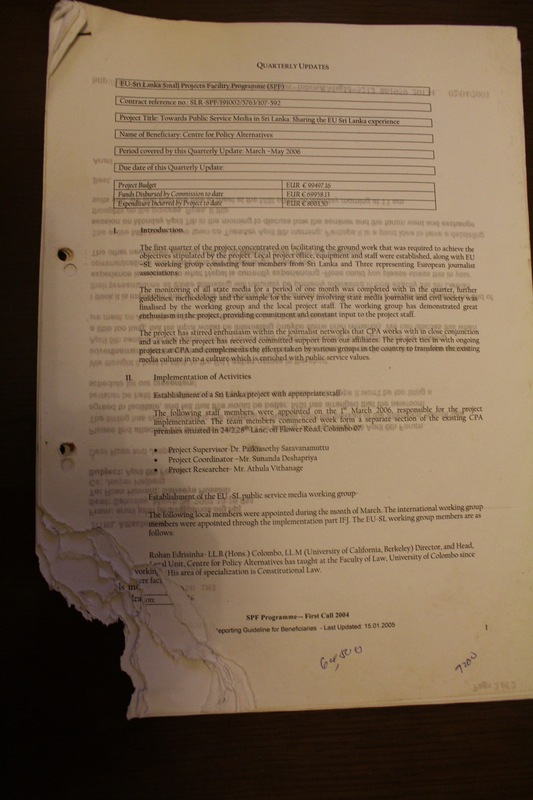 The moment we discovered that Dr Saravanamuttu was the “paid supervisor” for the European Union funded project (click here to read the first “quarterly update” submitted to EU by CPA), Colombo Telegraph had no option but to inform him as well as the CPA’s Board of Directors that it’s not our duty to provide them documents. We are also aware that at least one whistleblower had informed him about the malpractices based on his (the whistle-blower’s) experience related to these projects. “Your last email is noted. As spelt out by us in previous e-mails, on the basis of the documentation provided by you in support of your allegations and based on organisational records, we find your allegations unsupported and unwarranted. “You have said, ‘we ( CPA Board?) consider further communication with you futile and reiterate our position that these allegations are clearly mala fide’. The CPA is yet to answer the questions above. But let’s explore what really happened to/with the Public Service Broadcasting campaign Projects. The CPA was required to appoint a group of experts to advise it on this project in line with the agreement with UNESCO. Accordingly they appointed Rohan Edirisinghe, Tilak Jayaratne, Sumanasiri Liyanage and Sunil Wijesiriwardene. They met only once. The meeting was held in the CPA office. Rohan Edirisinghe did not attend. Tilak Jayaratne and Sumanasiri Liyanage raised several questions regarding the objectives of the project, funding and other details. There is no record that any of them were paid. They never met again. A similar panel of experts had to be set up for the project funded by the EU. CPA director Rohan Edirisinghe (who never attended meetings), Dharmasiri Lankapeli, Sanath Balasooriya and Victor Ivan were appointed to the “working group of experts”. They were each paid Rs 100,000 but never met as a group. Victor Ivan, although a recipient of payment, criticized the way the CPA was handling the project. Even the EU, in their final evaluation report, after the project noted the fact that payments had been made to people who were not experts on the subject of public service broadcasting. According to the project proposal submitted to the EU, the CPA had to conduct a survey which included one to one interviews with 100 journalists of state media organisations and 30 civil society organizations. The CPA submitted that such interviews had indeed been conducted. The fact is that such a survey was never conducted. According to the “First Quarterly Report” submitted to the EU, Dr Saravanamuttu was the Project Supervisor while Sunanda Deshapriya was the Project Coordinator. 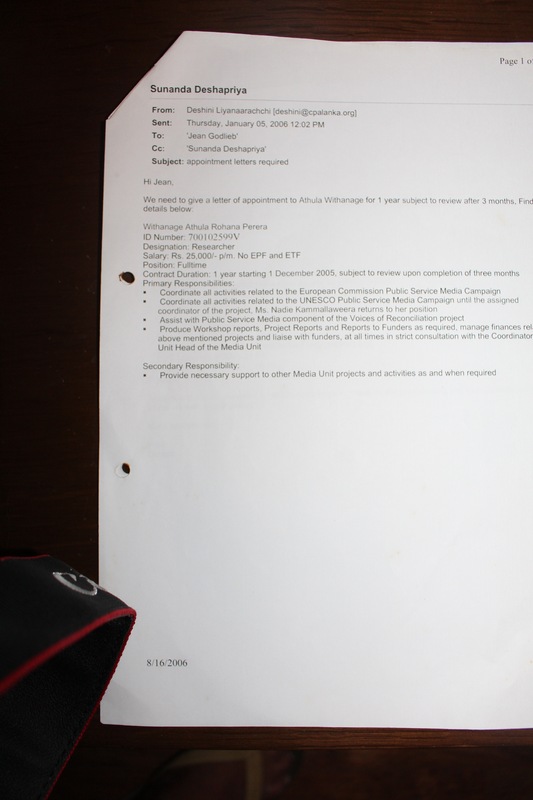 Athula Withange was hired as Project Researcher. Withanage confirmed that no such survey was done either by him or anyone else in the project staff or by an outsider. 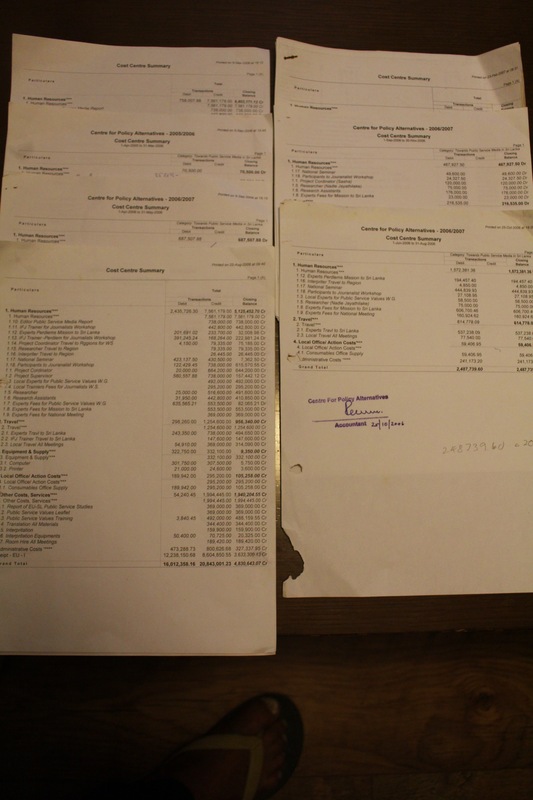 Although CPA hired him as “Project Researcher”, he was given lots of tasks and under paid. According to the job description given to him he was paid RS 25,000 and assigned to do lots of other work using EU funding. According to an internal communication (click here to read the full email) Withanage was given a one year contract with the following “primary responsibilities”: Coordinate all activities related to the European Commission Public Service Media Campaign, Coordinate all activities related to the UNSECO Public Service Media Campaign until the assigned Coordinator of the project, until Ms Nadie Kammallweera returns to this position, Assist with Public Service Media component of Voice of Reconciliation project (Colombo Telegraph Note: VOR is another massive multi-million rupee project under Canadian funding which Sanjana Hattotuwa and Sunanda Deshapriya conducted and which was also scandal-ridden), Produce Workshop reports, Project Reports and Reports to Funders as required, mange finances related to above mentioned projects and liaise with funders, at all times in strict consultation with the coordinator and Unit Head of the Media Unit. When contacted, Withanage told Colombo Telegraph, that he was new to the NGO field at the time, that it was his fist job in an NGO and that he did what he was asked to do. He said that the CPA had submitted the same bills to UNESCO and to the EU. He admitted that the workshops were not completed. “It was all corruption, I did not know what to do. Only one person advised me not to get involved with these corrupt activities”. He also said, “Nadie Kammallaweera wanted to complete all the activities, but CPA did not allow her to do so.” Colombo Telegraph can categorically state that she has not perpetrated any fraud with respect to this project. The project staff in general was helpless. Some of them were advised to inform Dr Saravanamuttu, but Colombo Telegraph does not know whether they indeed took up the issue with him. CPA had to conduct 12 workshops under the EU project and 6 workshops under UNESCO project. The CPA never completed the task, but submitted that bills for conducted “workshops” and manufactured bills to the donors by duplicating them. Over and above all this, we have credible information that Dr Saravanamuttu was blackmailed by a delegation of NGO activists including the late Sunila Abeysekera and Sunanda Deshapriya (through his friends) not to launch any investigation into the activities of the latter. They argued that this would open another Pandora Box and affect core funding scandals. It was after this that the delegation led by Sunila Abeysekera met with Dr Saravanamuttu, begging him to revoke his decision. They told him that it was detrimental to the peace and human rights movement in Sri Lanka and warned that others will use it against NGOs. Even though Dr Saravanamuttu disagreed with them at that time, on the following morning he came with the theory called “lacking clarity”. Sunanda was no longer a swindler but just someone who did something that “lacked clarity”. For the record, Deshapriya is still using that weak point and claiming that he did not rob any money! Ironically, these are the very people who question others on matters like integrity, good governance, transparency, etc. The promised investigation into projects under Sunanda Deshapriya was never held. Whistleblowers continue to send us information that indicates that there is fraud, nepotism, favoritism, selective punishment, signature forgeries and other serious problems in the CPA. We are in the process of investigating these allegations. We have given more than enough time to CPA to respond. It is up to the CPA to reply and clear its name. It is European Union’s and UNESCO’S duty to compare the project proposals and the bills which the CPA and IFJ have submitted and make them public. What we have shown is how people pocket NGO money and how they cheat the donors by producing forged bills. The story is still unfolding.